Mexican Independence Day in Guaymas, 2017. 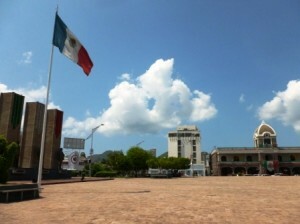 Guaymas is decorated in green, white and red and is ready for el Grito: Viva Mexico!! Felices Fiestas Patrias! September in Mexico is known as El Mes de la Patria — the month of our country. Look for push carts offering flags of all sizes, trumpets, sombreros and noisemakers, all in patriotic green, white and red. The main event is on September 15 – 16, when Mexicans celebrate their nation’s independence from Spanish rule. On Friday, September 15, join in the ceremony for El Grito (the Cry of Dolores that marked the beginning of the Mexican War of Independence) at the Three Presidents Plaza. The entertainment starts at 6:30pm with live music and dance and ends at 10:30pm with El Grito. On Wednesday, September 16, at 8:15am there will be a parade starting at La Paloma and continuing to Serdan and City Hall. See below for a map of the parade route. At 11:00am, the Mayor will give a “State of the Union/City Address” at Guaymas Auditorium. 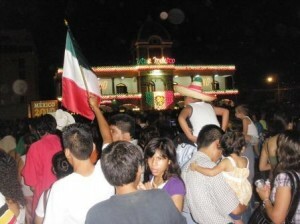 In Mexico, various festivities occur in September. It is known as Mes de la Patria, or the month of our nation. The main event is on September 15 – 16, when Mexicans celebrate their nation’s independence from Spanish rule. In the early hours of September 16, 1810, Father Miguel Hidalgo rang the bell of his little church, in Dolores Hidalgo, Guanajuato, Mexico, and rallied his congregation to fight for liberty. Father Hidalgo gave a speech that is now known as the “Grito de Dolores”, in which he proclaimed “Viva Mexico” and “Viva la independencia!” This was the catalyst for the country’s bloody eleven-year War of Independence. It is the moment that is commemorated and re-enacted in every plaza or zócalo in Mexico every 15th of September. 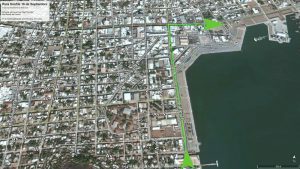 In preparation for the fiesta, Guaymas will be brightly decorated in green, white and red. On the evening of Wednesday, September 15th, there will be food stalls, children’s rides and live music in and around Plaza de los Tres Presidentes in Guaymas. The festivities will culminate when a government official gives the grito or cry of independence and the crowd returns the cry, remembering Father Hidalgo’s famous call to arms that eventually led to the liberty of a nation. On Independence Day, September 16th, there will be a short parade. On September 15 and 16, don your charros, china poblanas or anything red, white and green, head to Guaymas’ main plaza and help Mexico celebrate its independence.